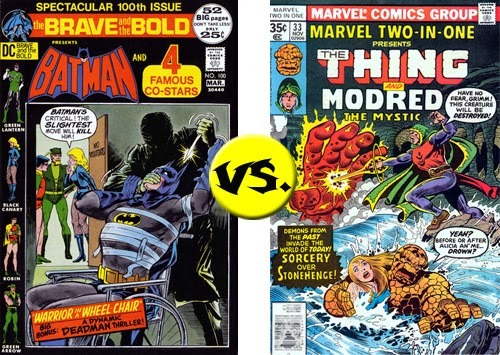 Batman leads 5 to 2, and he's not relieving the pressure on the Thing, not on his 100th issue anniversary day! Sorry, Ben, but this is really his to lose. 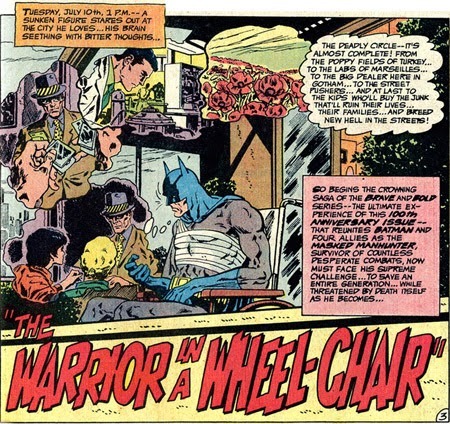 In the black corner... it's Batman and Robin, Green Lantern, Black Canary and Green Arrow, written by Bob Haney and drawn by Jim Aparo, Brave and the Bold #100, "The Warrior in a Wheel-Chair". 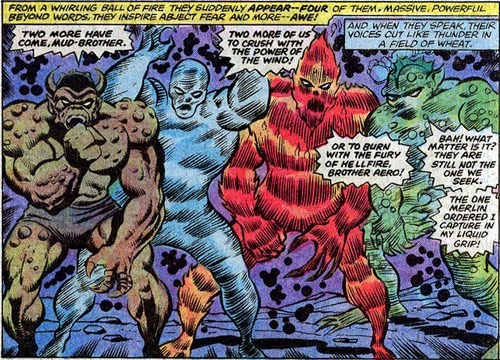 In the orange corner... we have the Thing and Modred the Mystic (and Spider-Woman), written by Marv Wolfman and drawn by Ron Wilson and Pablo Marcos, Marvel Two-in-One #33, From Stonehenge... with Death! 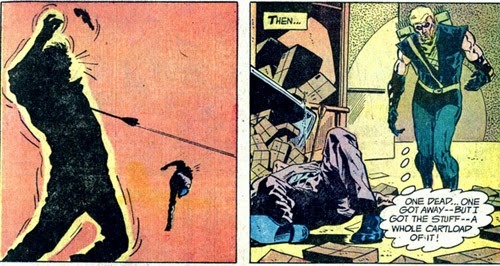 B&B's 100th-issue spectacular begins with Batman being shot in the heart by a sniper Captain America-style. 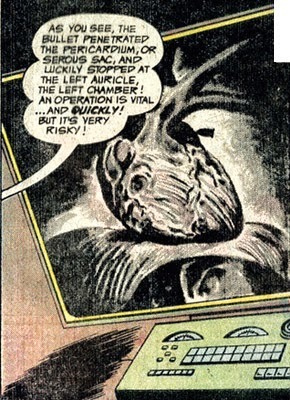 He survives, but needs an operation from the famous Dr. Hellstrom of Zurich, the only man able to take the bullet out of his chest before it hits his heart. But what'll he do while he waits the required three days for the good doctor to arrive? Get life-saving armor like Tony Stark? Nope. Allow his physician to induce a coma that will keep him from moving around? Neither. How about SAVE AN ENTIRE GENERATION FROM THE DRUG TRADE WHILE CONFINED TO A WHEELCHAIR?! 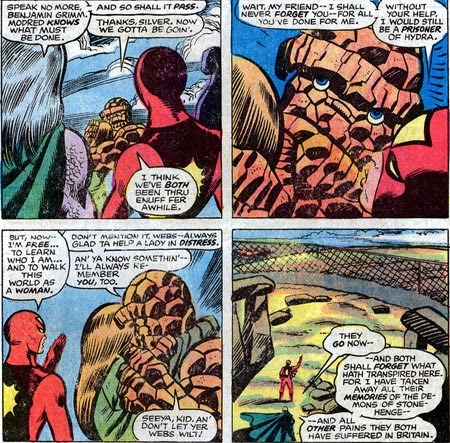 Ben Grimm is a lover, not a fighter. Well okay, he's a fighter, but there's an awful lot of monster smooching in this issue. Robin thinks girls are icky and doesn't know what Black Canary could possibly bring to the team. She's useless! And there's every chance that Bob Haney agrees with him: Dinah gets off the grid for a while to dry her hair, no joke. But they DO need her because one of the drug kingpin's potential smuggling operations is an evil Euro-feminist rally, no boys allowed. I miss the days when Batman would just have sent Robin in in drag. 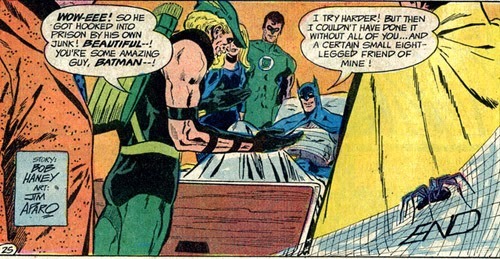 No matter, under Jim Aparo's pencil, everyone gets hit SO HARD, and Black Canary doesn't make an exception for Monique de la Tour, author of "Why, Men?" (wouldn't removing the comma make for a more militant title?). Speaking of men, the guys do a little better, or at least don't get sidetracked by muggy weather. Green Arrow attacks the evil post office... and KILLS A DUDE! Look, GA has a very real reason to hate smack dealers. They ruined his sidekick. 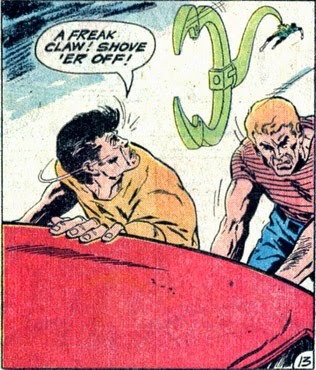 Meanwhile, Green Lantern shuts down operations at Gotham City's docks WITH HIS FREAK CLAW! Ben also has more than one guest-star, because Spider-Woman is following him around. Told you, he's a lover. And she could be an Olympic diver, even if her experience is less with swimming pools than it is with giant water elementals. 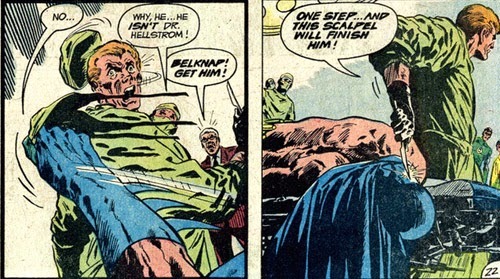 Batman faces the "Drug Ring" and its Euro-trash kingpin, Belknap. This guy believes in redundancies, have no less than four ways to get his Swiss smack into the U.S. (all through Gotham City), but he's no simple mastermind. He's also rather hands on. When his smuggling operation is threatened, he shows up at the hospital disguised as a surgeon and means to off Batman HIMSELF. 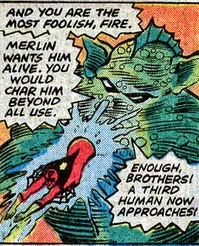 Ben and his Amazing Friends are up against elemental giants summoned up by Merlin to capture Modred. -Look, Doctor Who fans! It's the Underhenge! 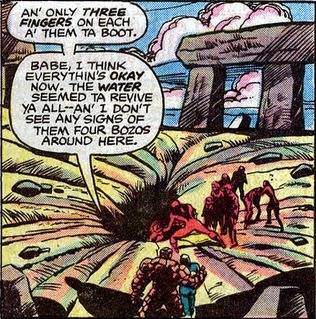 In the comics, it's like a pocket of Hell itself, filled with the zombie husks of tourists who dared visit Stonehenge. And it's real chilly; Alicia keeps going on about the sweater she wishes she'd brought even though she's wearing a snug hoody! A narrow miss for Team Grimm! Batman's Drug Busters 21, Modred the Mystic 19! The Bat's lead is growing, now at 6 to 2. But with his Anniversary issue out of the way, will the Dark Knight Detective now sit on his laurels? My first thought with the hairdrying scene wasn't about the sexism, it was, "I wonder what 1970s wigs were made of, and could they catch on fire in a hair dryer". And that, ladies and gentlemen, is all the proof of my nerdiness you'll ever need. More Aparo artwork! People just don't use Zipatone anymore, and it's a darned shame. 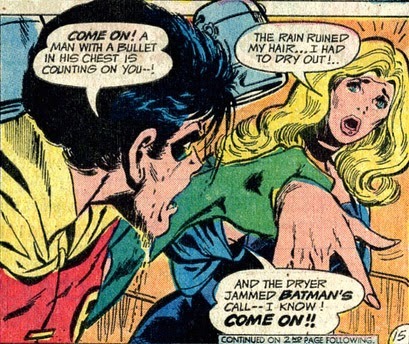 And yeesh, Dinah, you're wearing a wig for Pete's sake! Get it together! Maybe it's not a wig! Remember, this is Earth-B's Black Canary. She's Bruce Wayne's secretary and might actually be blond! Hmmm...I thought it was still a wig at this point. She actually had black hair, and eventually, she did decide that the wig was a pain and simply started dying it. On Earth-1, sure. Bob Haney's world is... variable, shall we say. Dating Lucy Lane: Are You Man Enough?